2 Chronic Low Back Pain: Not Always Mechanical? 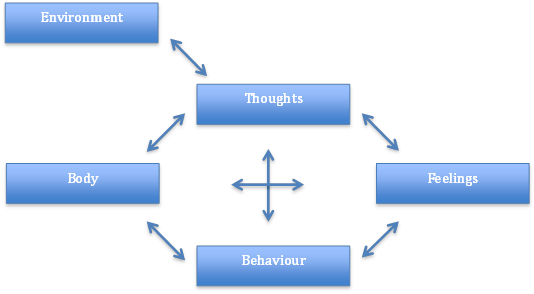 This page is designed to outline and review existing literature on the different types of Cognitive Behavioural Therapy (CBT). Additionally, literature comparing the different types of therapy has been analysed with relation to Physiotherapy. Chronic Low Back Pain: Not Always Mechanical? In recent years, Chronic Low Back Pain (CLBP) has been extensively researched to understand the confounding variables and barriers that affect people’s recovery rates. Throughout these years, an extensive amount of research has studied the role of psychological issues in the development and maintenance of chronic low back pain. Studies during this time have suggested that an increasingly negative orientation toward pain and fear of movement, or re-injury, are highly important in the aetiology of chronic low back pain . Therefore it has been suggested that a mechanical structure is not always the origin of chronic low back pain, but has a greater psychological association instead. 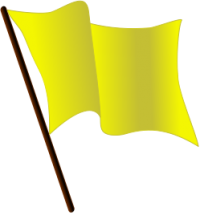 Clinicians identify psychological factors as Yellow Flags. Flags in Physiotherapy are a marker of risk factors regarding musculoskeletal diseases and disorders. Yellow Flags are an indication of Psychosocial factors (Depression, Anxiety etc..) and the patient’s beliefs about their condition . Attitudes/Beliefs – What does the patient think to be the problem and do they have a positive or negative attitude to the pain and potential treatment? Behaviour – Has the patient changed their behaviour to the pain? Have they reduced activity or compensating for certain movements. Early signs of catastrophising and fear-avoidance? Compensation – Are they awaiting a claim due to a potential accident? Is this placing unnecessary stress on their life? . Diagnosis/Treatment – Has the language that has been used had an effect on patient thoughts? Have they had previous treatment for the pain before, and was there a conflicting diagnosis? This could cause the patient to over-think the issue, leading to catastrophising and fear-avoidance. Emotions – Does the patient have any underlying emotional issues that could lead to an increased potential for chronic pain? Collect a thorough background on their psychological history. Work – Are they currently off work? Financial issues could potentially arise? What are the patient’s thoughts about their working environment? Another psychological issue associated with CLBP is catastrophizing. This is outlined through the Fear Avoidance Model (Shown Below). Fear is the emotional reaction to a specific, identifiable and immediate threat, such as a dangerous injury . Fear may protect the individual from impeding danger as it instigates the defensive behaviour that is associated with the fight or flight response . The Fear-Avoidance Model was designed to identify and explain why chronic low back pain problems, and associated disability, develop in members of the population suffering from an onset of low back pain . This model indicates that a person suffering from pain will undergo one of two different pathways (Fig.1). This shows that when pain/injury occurs, people will take the path of continuing their independence without negative thoughts of the pain they are suffering from, therefore leading them to accept that they have this pain that ultimately accumulates to a faster recovery. In contrast to this, a cycle can be initiated if the pain is misinterpreted in a catastrophising manner. It has been recognised that these thoughts can lead on to pain-related fear and associated safety seeking behaviours, such as avoidance. However, this could cause the pain to become worse and enter a chronic phase due to the disuse and disability. This in turn can lower the threshold at which the person will experience pain. The Biopsychosocial model is a conceptual model that suggests that in understanding a person's medical condition it is not simply the biological factors to consider, but also the psychological and social factors . It is commonly used in chronic pain, with the view that the pain is a psychophysiological behaviour pattern that cannot be categorised into biological, psychological, or social factors alone. There are suggestions that physiotherapy should integrate psychological treatment to address all components comprising the experience of chronic pain. The diagram below shows an example of this model. • How people think about their situations, influences how they feel and what they do. • Problems like depression, anxiety and self-defeating behaviour can be broken down by problematic thought patterns. • People can learn to identify distorted thinking, change their outlook, take constructive action, and feel better. The highly structured nature of CBT means it can be provided in different formats, including in groups, self-help books and computer programs. Does not use a holistic approach to a patient’s situation. Skills learnt through CBT are useful, practical and helpful. These strategies can be incorporated into daily lifestyle and benefit the management with future stresses and difficulties. Due to the structured nature of CBT, it may not be suitable for people with more complex mental health needs or learning difficulties. Commitment is required from the patient. A therapist can help and advise them, but may be unsuccessful without co-operation from the patient. Examples of Outcome Measures are shown below. The Pain Anxiety Symptom Scale (PASS) is used as a measure to evaluate the patients ‘fear of pain’. It is intended to provide a means of ‘fear of pain’ in exaggerated or persistent pain behaviours . This was created because anxious responses can lead to avoidance behaviours that can then lead to chronic pain. The Pain Anxiety Symptom Scale has been classed as having a high level of validity when used in clinical practice . The Chronic Pain Acceptance Questionnaire is a 20-Item Scale that covers two components; Activity Engagement and Pain Willingness. Activity Engagement is used in accordance to measure patient’s participation in activities regardless of pain, while Pain Willingness assesses relative absence of attempts to control or avoid pain. This outcome measure has been found to have a good scale of reliability . Cognitive Therapy was developed and pioneered by Dr Aaron Beck in the 1960’s. During this time, it was employed as an information-processing model to understand and treat psychopathological conditions. Cognitive Therapy (CT), as mentioned above, is one part of the entire CBT model and an approach to treating chronic pain. This process proposes that distorted or dysfunctional thinking can influence a patient’s mood and psychological beliefs, which has been found to coincide with chronic pain   . This treatment involves the identification and replacement of misrepresented thoughts and beliefs that a patient could be feeling. Cognitive Therapy is a problem-solving treatment based on the principle that we perceive situations, influences how we feel about them . The effectiveness of CT has shown positive outcomes regarding depression and anxiety disorders. Alongside these psychological benefits, it has provided positive results concerning certain medical issues, including chronic fatigue syndrome and other chronic pain disorders . • Becoming aware of the ways that thoughts can influence feelings, that can be detrimental and harmful. • Learning about thoughts that seem to occur automatically, without even realising how they may affect emotions. • Critical evaluation of whether these automatic assumptions are accurate. • Developing skills to notice, interrupt, and correct these thoughts independently . 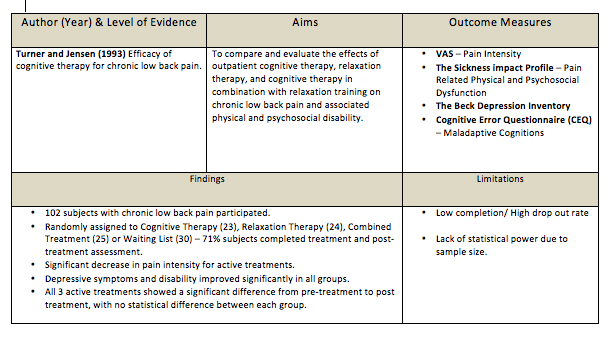 Limited evidence of Cognitive Therapy on the effect of Chronic Low Back Pain is available . 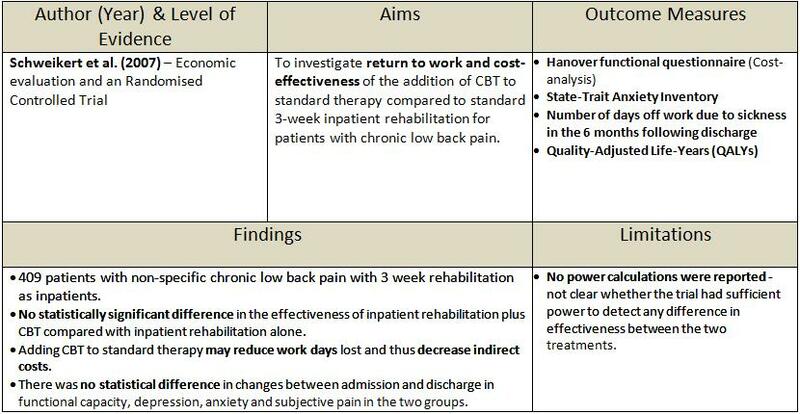 The following table is a breakdown of a randomised controlled trial on CT for Chronic Low Back Pain. Behavioural Therapy (BT) was developed in the 1950's. It was originally used to treat psychological issues such as depression, but has been used more recently to treat other conditions such as CLBP. Behavioural Therapy is split into two areas - Operant Therapy and Respondant Therapy. Both parts of Behvioural Therapy look at changing detremental behaviours to more healthy and positive behaviours . Operant therapy is based on the Operant Conditioning principles, first proposed by Skinner (1953) in his book, Science and Human Behaviour. The Operant behavioural model was first applied to CLBP by Fordyce (1976), in his book Behavioural Methods for Chronic pain and Illness . Operant Behavioural Therapy or Operant Conditioning proposes that pain behaviours learnt by an individual can be reinforced by external factors  . These external factors are positive reinforcements of the pain behaviours, used by the patient, which can be detrimental to their long term health. These factors often include detrimental attention from family, medical personnel, dependency on pain medication and excessive rest. Therefore, operant behavioural therapy looks at removing these damaging, positive reinforcements, and replacing them with more healthy behaviour. Operant behavioural techniques often involve the use of increased exercise levels, and work to meet targets set by the patient and clinician. This method can also be helped by incorporating the family and friends of the patient, to maintain and monitor the change back to more healthy behaviours. With each goal that is achieved, the patient is positively reinforced by all staff and personnel involved . Operant Therapy is used in a variety of clinical settings . Operant therapy is primarily used to treat psychological issues, such as depression and anxiety. It has also been used as part of a Multi-disciplinary approach to treating long term conditions, such as CLBP and Fibromyalgia ; . Thieme et al. (2007) looked at the effects of Operant Behaviour therapy on 125 Fibromyalgia patients. After a 12 month follow up, it showed that 53.5% of patients in the Operant Therapy group had meaningful improvements in pain intensity. Respondent therapy is an approach to behavioural therapy with aims to modify the body’s physiological response to pain, by reducing muscular tension . 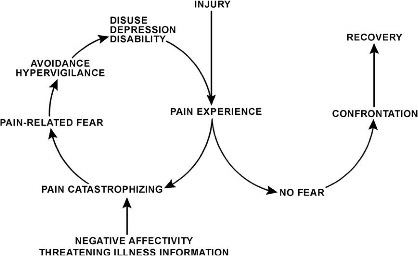 The respondent model, as described by Gentry and Bernal (1977) , theorises that physical damage can lead to a pain-tension cycle. Fig. 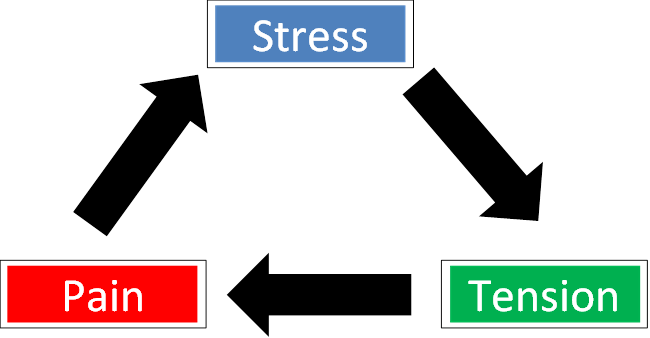 7 Diagram to represent the Pain-Tension Cycle in a simplified manner. This cycle is viewed as a cause and a result of muscular tension . 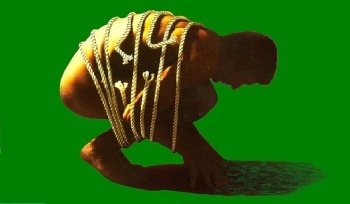 It states that whilst avoidance of movement may be used to reduce pain, the resulting decreased mobility may increase the tension, and thus pain furthermore. Respondent therapy aims to disrupt this cycle using methods such as relaxation, progressive relaxation, applied relaxation and Electromyographic (EMG) feedback. These methods are used to reduce the muscular tension, relieving anxiety and thus the subsequent pain  . Progressive relaxation is a technique for learning to monitor and control the state of muscular tension . It was developed by American physician Edmund Jacobson in the early 1920s. The technique involves learning to monitor tension in each specific muscle group in the body by deliberately inducing tension in each group. Upon releasing this tension, attention is paid to the contrast between tension and relaxation. It is to be noted that these are not considered to be exercises or hypnotism. The “Applied Relaxation” protocol developed in Sweden, by the psychologist Lars-Goran Öst, modified from Jacobson’s progressive relaxation technique. It expands on progressive relaxation but involves attempting to relax more quickly and in different scenarios . EMG feedback, in respondent therapy, is used as a point of reference for a patient to objectify their muscle relaxation techniques . It uses several surface electrodes to detect the action potentials of muscles, giving appropriate feedback as to the state of muscular contraction. Several studies have compared respondent therapy using progressive relaxation to a placebo   . Results showed favourable effects of the active treatment, which was not statistically significant, as the waiting list control also showed improvements. Four studies have identified respondent therapy with EMG feedback against a placebo; ; ; ). These studies showed slightly favourable results for the intervention, but produced no significant results. One study compared respondent therapy against self-hypnosis . It concluded that neither intervention were superior to the other due its non-significant results compared to the placebo. One study compared a combination of respondent therapy with EMG feedback, and physiotherapy, with physiotherapy alone . Significant differences noted in favour of the combined intervention for pain post-treatment, after 6 weeks and 6 months. A study  compared cognitive and operant therapy. Both groups also received physiotherapy is the form of an exercise programme and education, for the management of back pain. 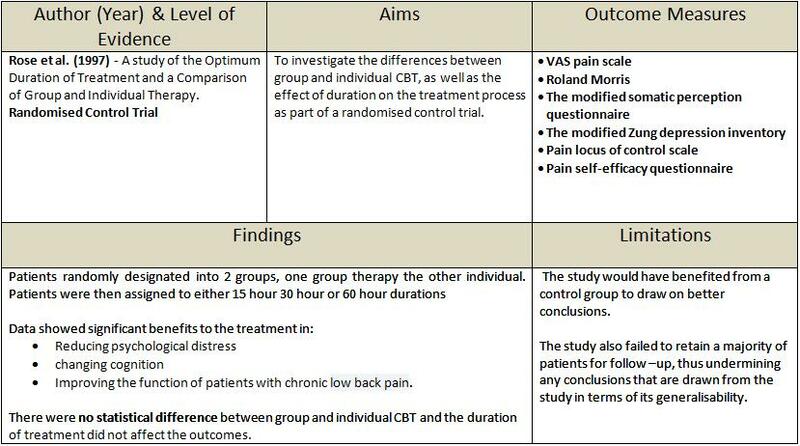 The operant therapy group reported a signiﬁcant improvement in general function status, but did not find the same results for pain intensity. The quality of this study is in question, as a systematic review by Middlekoop et al,. (2011)  reported that the study has a high risk of bias. Two studies   compared cognitive therapy to respondent therapy, in the form of progressive relaxation training. Only one of these studies reported on long-term pain and disability. These outcomes were not statistically significant between the groups. The review by Middelkoop et al. (2011) also found these studies to have a high risk of bias. 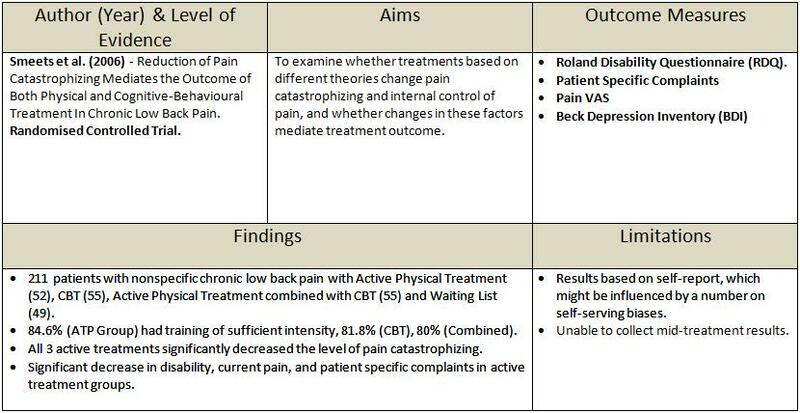 Previous research has shown CBT to be an effective form of therapy on Chronic Low Back Pain (CLBP). ↑ McCracken, L.M., Zayfert, C. and Gross, R.T. (1992) The Pain Anxiety Symptoms Scale: Development and Validation of a scale to measure fear of pain. Pain, 50(1), 67-73. ↑ Burns, J.W., Mullen, J.T., Higdon, L.J., Wei, J.M. and Lanksy, D. (2000) Validity of the pain anxiety symptoms scale (PASS): Prediction of physical capacity variables. Pain, 84(2-3), 247-252. ↑ Fish, R.A., McGuire, B., Hogan, M., Morrison, T.G. and Stewart, I. (2010) Validation of the chronic pain acceptance questionnaire (CPAQ) in an Internet sample and development and preliminary validation of the CPAQ-8. Pain, 149(3), 435-443. ↑ 27.0 27.1 27.2 27.3 27.4 Henschke, N., Ostelo, R.W.J.G., van Tulder, M.W., Vlaeyen, J.W.S., Morley, S., Assendelft, W.J.J., Main, C.J., 2010. 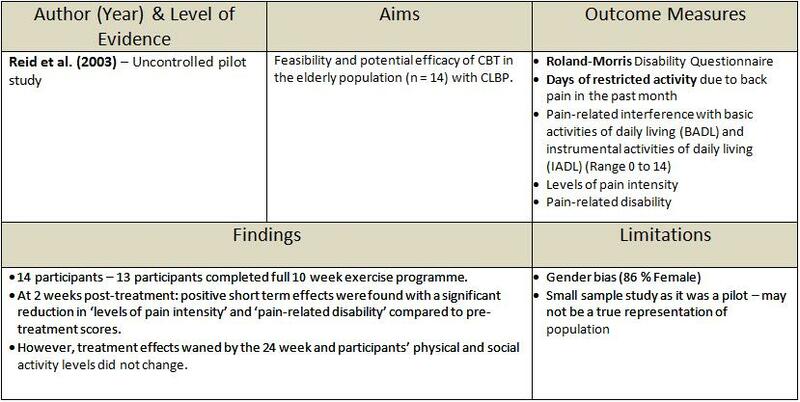 Behavioural treatment for chronic low-back pain, (Review) The Cochrane Library [online],fckLRAvailable at: http://onlinelibrary.wiley.com/doi/10.1002/14651858.CD002014.pub3/pdf/standard. [Accessed 9th Jan 2014]fckLRJacobsen, E., 1929. Progressive relaxation. University of Chicago Press: Oxford, England. ↑ Jacobsen, E., 1929. Progressive relaxation. University of Chicago Press: Oxford, England. ↑ Bush, C., Ditto, B., Feuerstein, M., 1985. A controlled evaluation of paraspinal EMG biofeedback in the treatment of chronic low back pain. Health Psychology, 4:307–21.